This tutorial will introduce the solution for disk space reallocating on Windows SBS 2003 when has low disk space problem. Download IM-Magic Partition Resizer Server to reallocate disk space when partition is running on low in Windows SBS 2003. What can you do if you want to reallocate disk space on Windows SBS 2003? Do you need to repartition hard disk or reinstall system? Well, IM-Magic Partition Resizer Server enables you to reallocate disk space easily without reinstalling system or repartition hard disk. This software works as partition magic, with which you can extend partition that has low disk space and shrink partition that has much free space. In such a way, you can reallocate disk space without moving or deleting any data. Move the arrows to shrink the selected partition so as to squeeze some unallocated space. You need to move the unallocated space close to the partition you need to extend. Then, right click the partition and choose "Resize/Move" option. "After installing operating system, C drive is nearly full and Windows system reports low disk space alert on this drive. There are lots of important programs on C drive and I don't want to uninstall and reinstall those programs. 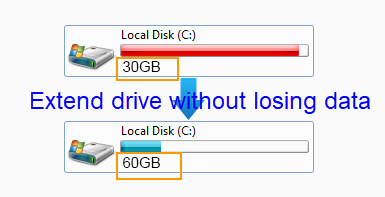 I am wondering if I can reallocate the disk space so that I can move some free space from other drive to C drive. The operating system on my computer is SBS 2003. By the way, I want to resize C drive without reinstalling system. It is a difficult and complex task to reinstall system." "I need to reallocate some more space to system partition on Windows SBS 2003 because it is running out of disk space. There is another partition that stall has much free space. Can I reallocate disk space on SBS 2003 system partition without formatting the disk? I hope somebody can recommend a safe way to reallocate disk space because I don't want to damage the operating system. Thanks for any help!" It is wrong if you still believe that the only solution for disk space reallocating is to repartition the hard disk. Professional partition software has taken place of traditional way (repartition hard disk), which helps resize hard disk and reallocate disk space only with several mouse clicks. 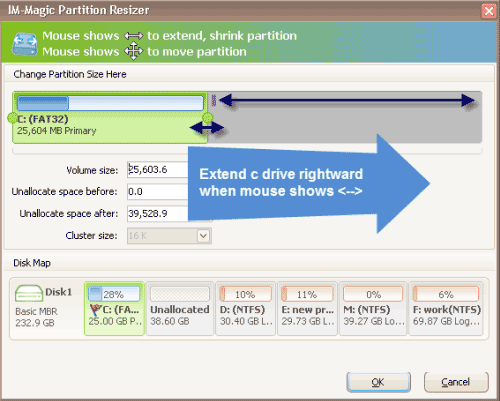 IM-Magic Partition Resizer Server helps reallocate disk space by moving free space from one partition to another. In such a way, you can squeeze free space from the partition that has much free space to create some unallocated space, and the add the unallocated space to the partition that is lacking of free space. System partition refers to the partition on which operating system is installed. Usually, operating system is installed on C drive, so system partition is also known as C drive. IM-Magic Partition Resizer Server can resize system partition C drive without hurting the operating system or other data stored on this partition. You even don't need to backup data, because the software provides completely secure solution for disk partition space reallocating. The partition software is helpful with system partition resizing when you meet the problem like system partition runs out of disk space, C drive runs on low disk space or there is no enough free space for data storage on system partition. Apart from SBS 2003, Windows Server operating systems also include Windows 2003, 2008, 2012, Windows Server 2003 R2, Windows Server 2008 R2, Windows Server 2012 R2 and Windows SBS 2008. Each Windows Server has its own features. IM-Magic Partition Resizer Server supports all Windows Servers when you need to resize hard disk but do not want to waste time repartitioning hard disk. This partition software is always available for disk partition space reallocating as long as there is free space on the same hard disk. All data will keep untouched when you extend a partition, shrink a partition or move a partition.